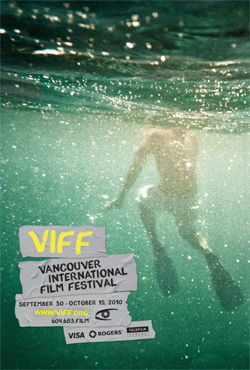 The Vancouver International Film Festival is not counted among the major festivals of the world. Coming after Venice and Toronto, overlapping with New York and Pusan, and running fifteen full days of screenings, it doesn’t arrive with high profile premieres or attract the kind of celebrities that impresses the paparazzi. It focuses on bringing in not the international press but the local audiences, the “local” designation extending all the way down to my neck of the woods. Only three hours from Seattle by car (a little longer by train), it’s an easy festival for me to attend, either in day trips or longer stays with a few nights at a downtown hotel, and it’s an attractive festival: well organized, packed with screenings, full of variety yet marked by special sections. Centered in the lively downtown area, where the streets are alive and buzzing long after midnight on the weekends, it presents films in ten theaters daily, nine of them within a few block radius. The tenth, the newly added Park Theatre (replacing the longtime festival venue The Ridge), is a few miles out but easily accessible by the Canada line, the subway that jets from downtown to the airport, and quite convenient. Seattle is my hometown festival, but Vancouver is my home away from home festival, a pure pleasure to attend every year, whether for a weekend or a week. VIFF 2010 kicked off on Thursday, September 30 with a full day of screenings crowned with the opening night gala Barney’s Version, and ends Friday, October 15 with an abbreviated screening schedule capped by the closing night gala presentation of Sylvain Chomet’s The Illusionist. In between, over 220 features and around 150 shorts from 80 coountries are publically screened. The line-up is impressive, studded with films out of Cannes or fresh off Toronto and Venice and concurrently getting attention at the New York Film Festival: Olivier Assayas’ Carlos, Abbas Kiarostami’s Certified Copy, Mike Leigh’s Another Year, Raul Ruiz’s The Mysteries of Lisbon, Manoel de Oliveira’s The Strange Case of Angelica, Hong Sangsoo’s Oki’s Movie, Xavier Beauvois’ Of Gods and Men, Cristi Puiu’s Aurore and the Cannes Camera d’or winner, Apichatpong Weerasethakul’s Uncle Boonmee Who Can Recall His Past Lives, and probably some others that slipped my mind at the moment. It has a Canadian Images section, an annual Spotlight on France and a healthy selection of non-fiction features, and this year they’ve added special focus sections on African Cinema and Ecologically-minded cinema. But what captures my attention, year after year, is Dragons and Tigers, “the largest annual exhibition of East Asian film outside of Asia” (I’m quoting the festival here) now in its 25th year. 45 programs of shorts and features, fiction and documentary, big budget commercial releases and independent visions, are featured in this year’s line-up, curated by Tony Rayns and Shelly Kraicer, and eight features by new directors (making their first or second feature) are up for the Dragons and Tigers Award for Young Cinema. I’ll be writing up highlights over the next couple of weeks, mostly (but not exclusively) on the Asian films, as I travel back and forth from Seattle to Vancouver and hopefully find time to write between the films and the driving. And also check in on David Bordwell’s Website on Cinema, where he and Kristin Thompson (VIFF regulars for years now) share their discoveries and insights. Come to VIFF and you might see them in the front rows at the Dragons and Tigers screenings (or any of the other tantalizing films spread through the fest).